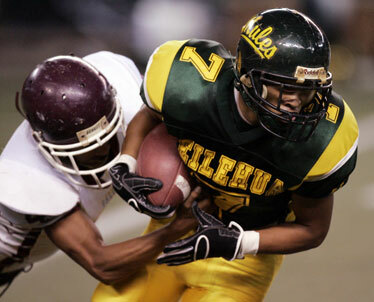 Leilehua's Zaire Macapagal tried to elude Baldwin's Kalei Kamahele in the first quarter last night. The baby-faced rookie stared down the wily, seasoned veteran and did the unthinkable. Andrew Manley, the super sophomore making just his fourth start, threw a pair of touchdown passes and finished with 263 yards as Leilehua upset No. 2-seeded Baldwin 41-34 last night in the semifinals of the First Hawaiian Bank/HHSAA Division I state football championships at Aloha Stadium. Manley outdueled Baldwin senior Jordan Helle in a fantastic battle of run-and-shoot gunslingers. "We took what they gave us," said Manley, who guided the Mules to three consecutive touchdowns in the third quarter for a 41-27 lead. "They gave us Cover 3, so we had the seams." Helle finished 21-for-49 for 303 yards and four touchdowns. The senior had a chance to bring Baldwin back in the final minute, but his pass to Kalei Kamahele on a corner route at the goal line was intercepted by Allan Macam with 20 seconds remaining. Kamahele, who had 11 receptions for 166 yards and a touchdown, had a step on Macam going downfield. "I saw the receiver's head turn around," Macam said. "He slowed down so I knew the ball might be short. I got to stop, step forward and go up for the ball." A frenzied crowd of 7,842 saw Oahu Interscholastic Association champion Leilehua (9-4) rally from a 13-point deficit thanks to clutch defensive plays and Manley's timely passes to a posse of receivers. Edieson Dumlao led the fleet with eight receptions for 123 yards as Leilehua took the shackles off Manley. He was 19-for-37 and took all the punishment Baldwin's swarming defense could offer. Leilehua will face top-seeded Saint Louis in the championship game on Friday. Baldwin closed the season at 9-2, losing the state semifinals for a third year in a row. "We just made some mental mistakes here and there," Baldwin coach A.J. Roloos said. "That's the great thing about this team, we got a lot of heart and they don't give up. But Leilehua's a damn good team." The Bears looked unstoppable early on. After botching an early fourth-and-2 play at midfield, Baldwin came through on defense. The Bears stopped Leilehua inside Baldwin territory to set up a nine-play, 84-yard march. Helle hit Nakamura for a pair of 12-yard strikes before Chansi Bolosan took over on the ground with 32 yards on four carries. Helle found Kalei Kamahele wide open on a streak route on the right side for a 27-yard touchdown. Moments later, a spectacular, diving interception by defensive back Joey Nakashima off a deflection gave the Bears first down at midfield. Three plays later, Helle launched a 52-yard bomb to Nakamura in stride on a post route, and Baldwin led 13-0 with 1:28 to go in the first quarter. The momentum, however, was about to turn in the Mules' favor. After four fruitless drives, the Mules finally got going with a 14-play, 57-yard march in the second quarter. Fullback Bronson Pausa scored on a 1-yard plunge. Baldwin's Mana Rosa blocked the PAT try, but Leilehua was within 13-6 with 4:39 remaining in the first half. On the ensuing play, Leilehua's Rico Newman forced a fumble to get his team the ball back. Three plays later, on third and 19, Manley fired a bullet to Elijah Manaea on a streak route on the right hashmark for a 34-yard touchdown with 3:04 left in the half. Three plays later, Leilehua linebacker Seth Shannon hit Bolosan to force another fumble. Robert Siavii picked up the bouncing ball and ran 47 yards untouched for another Mule touchdown. Leilehua led 20-13 with 2:39 left in the first half. Helle then delivered a 19-yard touchdown pass to Skyler Cabacungan on a deep out route to tie the game at 20 with 1:28 still remaining before intermission. RUSHING -- Baldwin: Chansi Bolosan 7-28, Cabacungan 1-1, Hell 8-(-41). Leilehua: Macapagal 12-71, Rico Newman 6-12, Pausa 3-2, Manley 7-(-28). PASSING -- Baldwin: Helle 21-49-3-303, Cabacungan 1-1-0-31. Leilehua: Manley 19-37-2-263, Newman 0-1-0-0. RECEIVING -- Baldwin: Kamahele 11-166, Nakamura 6-105, Cabacungan 4-58, Ross Aaron 1-5. Leilehua: Edieson Dumlao 8-123, Macapagal 4-22, Manaea 3-62, Macam 2-49, Pausa 1-10, Newman 1-(-3).